Reasonable to expect Moore's law for quantum computing? Currently, the number of physical or logical qubits in different quantum computing prototype devices cannot be meaningfully compared because no one has demonstrated scalable fault tolerance, e.g., [Gottesman]. (All qubits are not created equal.) This is true especially between different computational models (annealing vs. gates) and different substrates, but it also probably applies even for devices built by the same group in the same substrate simply because the marginal computational value of additional qubits in a non-fault-tolerant device is very murky. Likewise, the number of not-fault-tolerant qubits in the Martinis group has followed a roughly similar growth rate for 3 years. Furthermore, exponential growth in capacity is seen in many areas of classical information processing devices well beyond the number of transistors in an integrated circuit described by Moore's law, e.g., in storage capacity, RAM, power dissipation, and internet traffic. The time constant is very often in the range 1-3 years. My question: Once scalable fault-tolerance is achieved, how should we expect the number of qubits in a single device to scale in time? 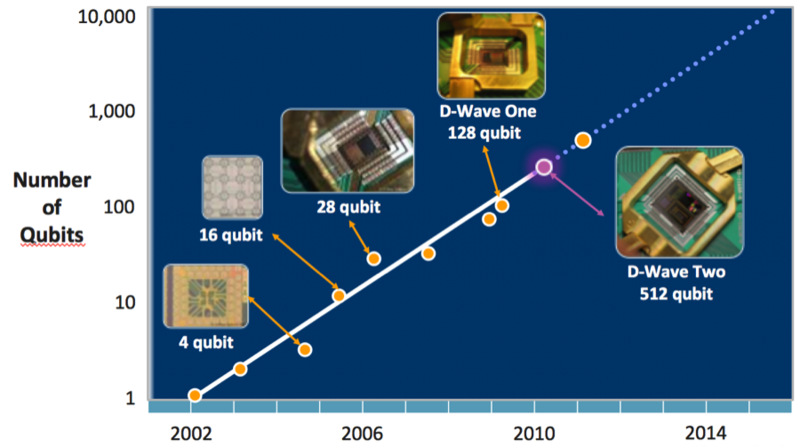 Is is reasonable to think qubit capacity will follow a "quantum Moore's law", doubling perhaps every 1-2 years? Conversely, are there reasons to think qubit growth will be much faster or slower, or not exponential at all? Assume that once quantum computers become scalable and fault tolerant, capacity (as measured in logical qubits) will plausibly follow Moore's law, doubling every ~1.5 years. When scalable, fault-tolerant quantum computation is achieved, it will start from essentially zero capacity (say, dozens of qubits). Therefore, for algorithms with quadratic speedups, the relative quantum advantage over classical computers is basically linear in total capacity. This is no better than doubling the speed of Moore's law for classical computers (i.e., double every 9 month), and it applies only for the (tiny) subset of all computations for which there is a quantum advantage. The effective doubling of Moore's law starts when quantum computers become big enough to compete with the best classical computers; quantum computers will start small, so we should not expect any initial "jump" in abilities. Not the answer you're looking for? Browse other questions tagged quantum-information quantum-computer or ask your own question. Is “analog” quantum-computation not useful? Can we make a Maxwell's Demon using Quantum Computers? are there known fundamental limits of quantum computer scaling? Why not implement quantum circuits on classical computers? Shor's algorithm - its causality and similar exploitation of QM? Shor's algorithm - why doesn't the final collapse of the auxiliary qubits cripple the computation? quantum superdense coding -How many qubits are needed?